Yom Kippur: How to repent & forgive- with other people and with God'- Rabbi Moshe Parry teaches us about repentance and forgiveness protocols for Yom Kippur, the Day of Atonement of the New Year. Heaven obligates us to pursue forgiveness from others we may have offended- and for those recipients of sincere appeals- to grant forgiveness, wipe the slate clean, and start afresh in the New Year. Just how long do we have to atone in a way which will enhance our fate for the New Year? 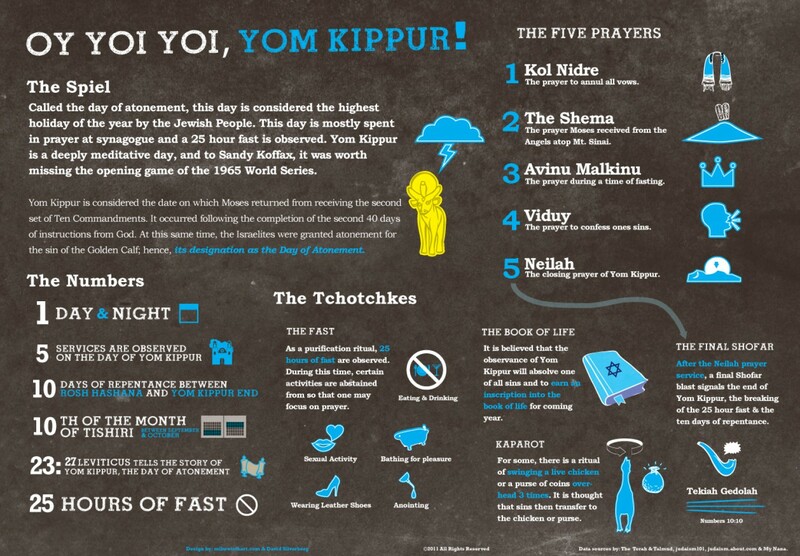 It doesn't end at Yom Kippur's Neilah prayer. Rabbi Moshe Parry breaks his 6-month absence from YouTube to overcome his facial half-paralysis and deliver this message for atoning and redeeming ourselves through these acts now. Judaism teaches that we can influence Heaven's forgiveness of our sins for the year though demonstrating charity, repentance, and prayer. These acts can alleviate the severity of His decree for our fate for this Hebrew New Year 5778, which we're only days into. Rabbi Moshe Parry encourages you (and your family and friends) to donate charitably to sustain the efforts of JewTube.Info, North America's original, Zionistic Jewish video news and information magazine. JewTube, in it's tenth-year, illuminates the quest for Jewish survival and dignity in a world of resurgent anti-Semitism. Please don't let the light burn out. Use this charitable opportunity to sustain JooTube's effort by making a one-time or (even better) recurring donation (via the icon in the right margin). May you and your family merit heaven's judgement for a year of good and health! Parades are often used to celebrate a New Year, but they vary with culture. Roman Calendar parades, such as Paris, London, and Pasadena, are typically held on January 1st. Chinese Lunar New Year parades are held in February. Hindu, lunar New Year parades, like the Iranian Nowrouz, are usually held around early Spring. This year, our lunar Rosh Hashana coincided with the beginning of Autumn. But Jews celebrate Rosh Hashana in synagogue praying, not parading. Instead of parading for New Years, Jewish-Americans hold a parade in New York City on the first Sunday in June, in honor of Israel's Independence Day (lunar calendar's 5th of Iyar). Other ethnic groups parade their culture through New York City streets, e.g., St. Patrick's Day Parade is essentially an Irish Pride Parade. The Columbus Day parade is like an Italian Pride Parade. So the Salute to Israel Parade (or as it has been called since 2011, the Celebrate Israel Parade) may be viewed as our Jewish Pride Parade. It's a rare opportunity to publicly express Jewish cultural identity- with police protection. And in the absence of a parade for Jewish New Years, to keep you in a celebratory spirit, enjoy a look at our original video from that first, Celebrate Israel Parade in 2011 (before it became politicized when Israel-boycotting pressure groups were welcomed to march). This event honoring Israel's 63rd birthday was held on June 5, 2011. The video segments include comments by Israel Amb. Michael Oren, Rep. Elliot Engel, Rep Charles Rangel, Grand Marshalls Eugene Gluck (a holocaust survivor) and Joseph Sitt of Thor Equities- who is redeveloping Coney Island. Israeli Ambassador Michael Oren said that on this day, America's love for Israel is on display- and the Israelis should be aware of it. NY's Channel 5 (Fox local) broadcasted the event live, co-hosted by Fox reporter John Huddy and Israeli actress and model Becky Griffin. Jewish people from America, Spain, the Mid-East are joined by refugees from anti-Semitic discrimination in Europe. Colorfully costumed Bukharian and Russian Jews participate- with ethnic costume, music, and dance. Christian Zionists of Eagles Wings and other groups also marched to show their love of Israel. Barack Hussein Obama's administration ran US policy soft on Islamism, the Muslim Brotherhood, and other Islamist enemies of Israel. Tens of thousands participated- see who (if anyone) you recognize. Part 2- Parading Zionist-pride at the 2011 Celebrate Israel Parade in New York City. Many metro-NYC Jewish school kids create banners, flags, and even floats for a parade which celebrates Israel's contributions to humanity in religion, spirituality, science, medicine, the arts, and defense against jihadism. The Chai-Riders Motorcycle Club close out the parade- with the vow of "Never Again" will Jew-haters prevail over the Jewish people. On Friday, the 2nd day of Rosh Hashana outside of Israel, Iran held its own parade- of weapons including nuclear capable missile with a range far-enough to strike most of the Middle East- including Israel. Iran's state-run, IRNA news agency quoted the chief of the Iranian Revolutionary Guard’s airspace division, Gen. Amir Ali Hajizadeh, saying the missile “can carry several warheads for various uses.” "As it was observed, the missile has become smaller in size and more tactical and it will be operational in the near future," he told reporters on the sidelines of the parade. Rouhani said at the parade that Tehran would not stop its missile program but instead boost military capabilities, despite U.S. demands. Rouhani also said Tehran would keep supporting the "oppressed people of Yemen, Syria and Palestine" — a reference to Iran's role in the wars in Yemen and Syria and its support for Palestinian militant groups such as Hamas. Israel used to hold military equipment parades, until after the Yom Kippur War, when it was determined to discontinue them. 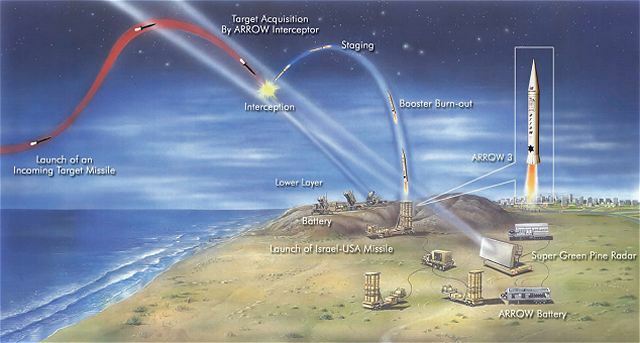 Israel relies on the Arrow 2 and Arrow 3 anti-missile programs to protect its public from Iran's ballistic missiles. Israeli Premier Benjamin Netanyahu addresses U.N.
"We’re in the midst of a great revolution, a revolution in Israel’s standing among the nations. This is happening because so many countries around the world have finally woken up to what Israel can do for them. Those countries now recognize what brilliant investors like Warren Buffet and great companies like Google and Intel, what they’ve recognized and known for years: that Israel is the innovation nation — the place for cutting-edge technology in agriculture, in water, in cyber security, in medicine, in autonomous vehicles — you name it, we’ve got it. "Those countries now also recognize Israel’s exceptional capabilities in fighting terrorism. In recent years, Israel has provided intelligence that has prevented dozens of major terrorist attacks around the world. We have saved countless lives. You may not know this, but your governments do, and they are working closely together with Israel to keep your countries safe and your citizens safe. I stood here last year on this podium and I spoke about this profound change in Israel’s standing in the world and just look at what has happened since, in one year: hundreds of presidents, prime ministers, foreign ministers and other leaders have visited Israel, many for the first time. Of these many visits, two were truly historic. In May, President Trump became the first American president to include Israel in his first visit abroad. President Trump stood at the Western Wall, at the foot of the Temple Mount, where the Jewish people’s Temples stood for nearly a thousand years. When the president touched those ancient stones, he touched our hearts forever. In July, Prime Minister Modi became the first Indian prime minister to visit Israel. You may have seen the pictures. We were on a beach in Hadera. We rode together in a jeep outfitted with a portable desalination device that some thriving Israeli entrepreneur invented. We took off our shoes, waded into the Mediterranean and drank seawater that had been purified only a few minutes earlier. We imagined the endless possibilities for Israel, India, for all humanity. In the past year, Israel hosted so many world leaders, and I had the honor of representing my country on six different continents. One year. Six continents. I went to Africa, where I saw Israeli innovators increasing crop yields, turning air into water, fighting AIDS. I went to Asia, where we deepened our relations with China and with Singapore, and expanded our cooperation with our Muslim friends in Azerbaijan and Kazakhstan. I went to Europe, where in London and Paris, Thessaloniki and Budapest, we enhanced our security and economic ties. I went to Australia, becoming the first Israeli prime minister to visit our great allies Down Under. And just last week, I went to South America, visiting Argentina and Colombia, and then I went on to Mexico, becoming, if you can believe it, the first Israeli prime minister ever to visit Latin America. After 70 years, the world is embracing Israel, and Israel is embracing the world. One year. Six continents. Now, it’s true. I haven’t yet visited Antarctica, but one day I want to go there too because I’ve heard that penguins are also enthusiastic supporters of Israel. You laugh, but penguins have no difficulty recognizing that some things are black and white, are right and wrong. It was absent last May, when the World Health Organization adopted — you have to listen to this: the World Health Organization adopted a Syrian-sponsored resolution that criticized Israel for health conditions on the Golan Heights. As the great John McEnroe would say, “You can-not be serious!” I mean, this is preposterous. Syria has barrel-bombed, starved, gassed and murdered hundreds of thousands of its own citizens and wounded millions more, while Israel has provided lifesaving medical care to thousands of Syrian victims of that very same carnage. Yet who does the World Health Organization criticize? Israel. So is there no limit to the UN’s absurdities when it comes to Israel? Well, apparently not, because in July, UNESCO declared the Tomb of the Patriarchs in Hebron a Palestinian World Heritage site. That’s worse than fake news. That’s fake history. Mind you, it’s true that Abraham, the father of both Ishmael and Isaac, is buried there, but so too are Isaac, Jacob, Sarah, Rebecca – Sarah is a Jewish name, by the way – and Leah, who just happen to be patriarchs and matriarchs of the Jewish people. You won’t read about that in the latest UNESCO report. But if you want to, you can read about that in a somewhat weightier publication — it’s called The Bible. I highly recommend it. (I hear it even got 4 ½ out of 5 stars on Amazon). And it’s a great read- I read (from) it every week! Ladies and gentlemen, a moment to be serious: Despite the absurdities, despite the repetition of these farcical events, there is change. Slowly but surely, there are signs of positive change, even at the United Nations. Mr. Secretary General, I very much appreciate your statement that denying Israel’s right to exist is anti-Semitism, pure and simple. Now, that’s important, because for too long the epicenter of global anti-Semitism has been right here at the UN. 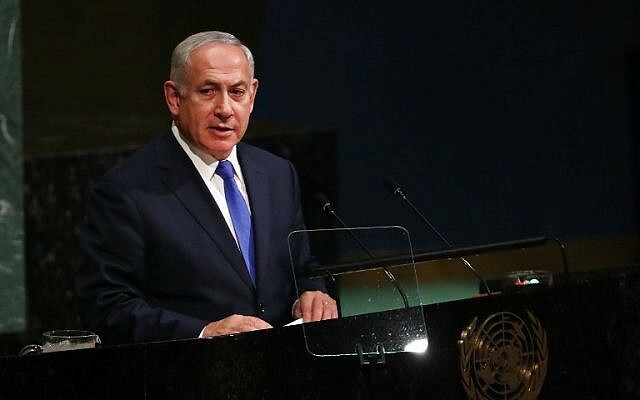 And while it may take many years, I am absolutely confident that the revolution in Israel’s ties with individual nations will ultimately be reflected in this hall of nations. I say that because there is also a marked change in the position of some of our key friends. Thanks to President Trump’s unequivocal support for Israel in this body, that positive change is gathering force. So, thank you, President Trump. Thank you for supporting Israel at the UN. And thank you for your support, Ambassador Nikki Haley. Thank you for speaking the truth about Israel. 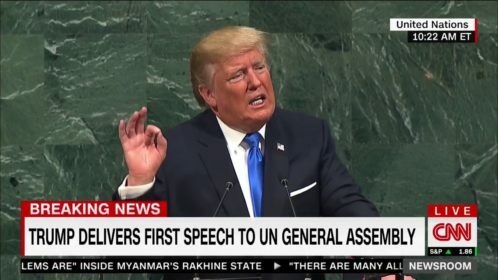 But, ladies and gentlemen, here at the UN, we must also speak the truth about Iran, as President Trump did so powerfully this morning. 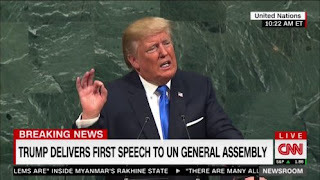 Now, you know I’ve been ambassador to the UN and I’m a long-serving Israeli prime minister, so I’ve listened to countless speeches in this hall, but I can say this: none were bolder, none more courageous and forthright than the one delivered by President Trump today. President Trump rightly called the nuclear deal with Iran, he called it an embarrassment. Well, I couldn’t agree with him more. And here’s why: Iran vows to destroy my country every day, including by its chief of staff the other day. Iran is conducting a campaign of conquest across the Middle East and Iran is developing ballistic missiles to threaten the entire world. Two years ago, I stood here and explained why the Iranian nuclear deal not only doesn’t block Iran’s path to the bomb, Iran’s nuclear program has what’s called a sunset clause. Let me explain what that term means: It means that in a few years, those restrictions will be automatically removed — not by a change in Iran’s behavior, not by a lessening of its terror or its aggression. They’ll just be removed by a mere change in the calendar. And I warned that when that sunset comes, a dark shadow will be cast over the entire Middle East and the world, because Iran will then be free to enrich uranium on an industrial scale, placing it on the threshold of a massive arsenal of nuclear weapons. That’s why I said two years ago that the greater danger is not that Iran will rush to a single bomb by breaking the deal, but that Iran will be able to build many bombs by keeping the deal! Now, in the last few months, we’ve all seen how dangerous even a few nuclear weapons can be in the hands of a small rogue regime. I know there are those who still defend the dangerous deal with Iran, arguing that it will block Iran’s path to the bomb. Ladies and gentlemen, That’s exactly what they said about the nuclear deal with North Korea, and we all know how that turned out. Unfortunately, if nothing changes, this deal will turn out exactly the same way. That’s why Israel’s policy regarding the nuclear deal with Iran is very simple: Change it or cancel it, fix it or nix it. Nixing the deal means restoring massive pressure on Iran, including crippling sanctions, until Iran fully dismantles its nuclear weapons capability. Fixing the deal requires many things, among them inspecting military and any other site that is suspect, and penalizing Iran for every violation. But above all, fixing the deal means getting rid of the sunset clause. And beyond fixing this bad deal, we must also stop Iran’s development of ballistic missiles and roll back its growing aggression in the region. I remember we had these debates. As you know, I took a fairly active role in them. And many supporters of the nuclear deal naively believed that it would moderate Iran. It would make it a responsible member, so they said, of the international community. Well as you know, I strongly disagreed. I warned that when the sanctions on Iran would be removed, Iran would behave like a hungry tiger unleashed, not joining the community of nations, but devouring nations, one after the other. And that’s precisely what Iran is doing today. Today, I have a simple message for Ayatollah Khamenei, the dictator of Iran: The light of Israel will never be extinguished. Those who threaten us with annihilation put themselves in mortal peril. Israel will defend itself with the full force of our arms and the full power of our convictions. We will act to prevent Iran from establishing permanent military bases in Syria for its air, sea and ground forces. We will act to prevent Iran from producing deadly weapons in Syria or in Lebanon for use against us. And we will act to prevent Iran from opening new terror fronts against Israel along our northern border. As long as Iran’s regime seeks the destruction of Israel, Iran will face no fiercer enemy than Israel.